The name Two by Three House becomes obvious when the rear extension of the house, designed by Architect Panovscott, is viewed. It is a vertical element made of 6 squares of alternating glass and wood paneling, two wide by three tall. The two story addition provides the residents with a combination of light, shade, privacy and views. The western red cedar and glass sections on the rear facade act like blinkers, framing views of treetops while shielding the family from being overlooked. 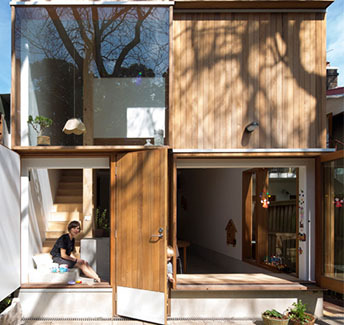 On the ground floor, glass doors and a timber panel fold back to open the house up to the garden. 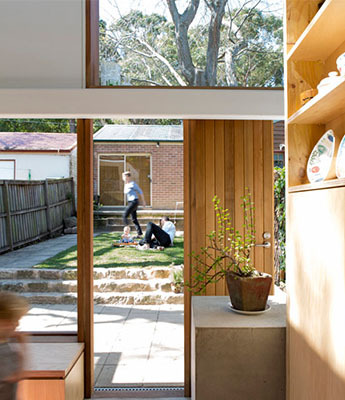 This extension to the existing residence is located in Sydney, Austrialia. The architect, Australian office Panovscott, designed the extension as a contrast to the original house. It is a light and airy while the existing house spaces tend to be a little darker. The home is located in Sydney’s densely inhabited inner west, an environment that is an increasingly gentrified subdivision originating around 1880. It is characterized by predominantly narrow east-west orientated housing parcels which face a large public park. As often happens, existing public facades remain the same so as to maintain the existing character of the neighborhood. The front half of the house remains and continues to act as the entrance. The front rooms have been changed minimally so as not to effect the existing manner of living. The high ceilings, small windows and wonderfully lean vertical timber construction establish the character typical of a Sydney terrace. Cool in both summer and winter and dark even on the brightest of days. A long hall penetrates these spaces and leads to the new extension at the back. At the end of the hall a small opening twists to the sky bringing gentle light though the upper level and into the center of the residence at the termination of the existing house and beginning of the addition. The light washes down a 45-degree rotated plywood panel. This panel, which is visible from the dark front rooms and immediately upon entry, it announces the differing quality of the new spaces. Moving towards this quiet light, the thin sliver of a brighter room beyond gradually widens. This great communal room on the first floor is slightly off the axial alignment of the original house. 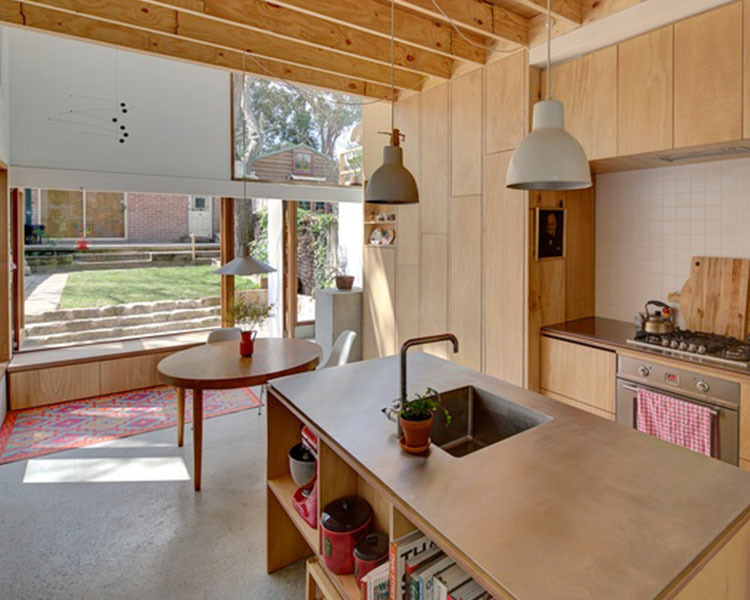 Light filled, it is a combined kitchen and dining space. The elegant vertical proportions and lean timber construction techniques of the front part of the house have been reinterpreted. Continuing the homecoming journey the room increases to 19 feet in height reaching upwards at its far end. The number and size of windows also increase gradually to this point allowing the internal space to expand horizontally as well as vertically and for the light levels to approach that of the external environment. The vertical circulation at the end of the space is a narrow stair concealed behind a ply lined wall and cabinets. The second level contains a master bedroom and suite, with a small window which looks back across the roof to the park, completing the journey through the house at the most private room.